Life is a journey. Every day is a new chapter. If you don't like it, change it. They say that a good book is one that, once finished, makes you feel as if you were parting from an old friend. Funny enough, that’s exactly how I felt when I read the last sentence on Time to Say Goodbye, debut novel by British author S. D. Robertson. Will Curtis dies in a car accident, a fact we know from page 1. His first and main concern as a spirit is to see how is 6 years old daughter Ella will react to his death and how she will carry on without him, having already lost her mum the day she was born. Being given the choice between staying a bit longer or going straight “upstairs”, Will decides to stay and wander around to check upon his family while trying to get through to Ella. As it happens, things are never as straightforward as they may seem, and even if odds seem to be on Will’s side, the decision he’ll have to take eventually won’t be an easy one: staying on Earth forever and look after Ella as a spirit or let her live her life, go to Heaven and wait for her there? 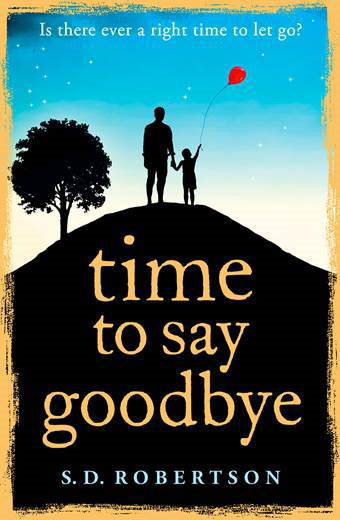 Characters from this book felt so real that I really felt as if I was bidding my farewell to my friends, once finished. Will, but also his parents, his sister, Ella, they all seem so real that at times I felt as if I was reading about the lives of actual living people. As an author I always have very high expectations towards each and every book I read. I expect a lot from the plot, I hope to get attached to the characters, to be kept awaken late at night, reading, and all that because that’s what happens when I’m working on my own books. I was thus glad and positively surprised to find in the tragically beautiful story of Will and Ella exactly the type of story that pushed me to carry on reading, and when I got to the last page I was at a loss and even felt a bit of disappointment at the thought that it was over, that it was, in fact, time to say goodbye to them all. It’s a terrible and yet marvellous feeling; to me, it means that this book indeed left me something. A moving, beautifully written novel I’d happily put on my “re-read” shelf, one day.